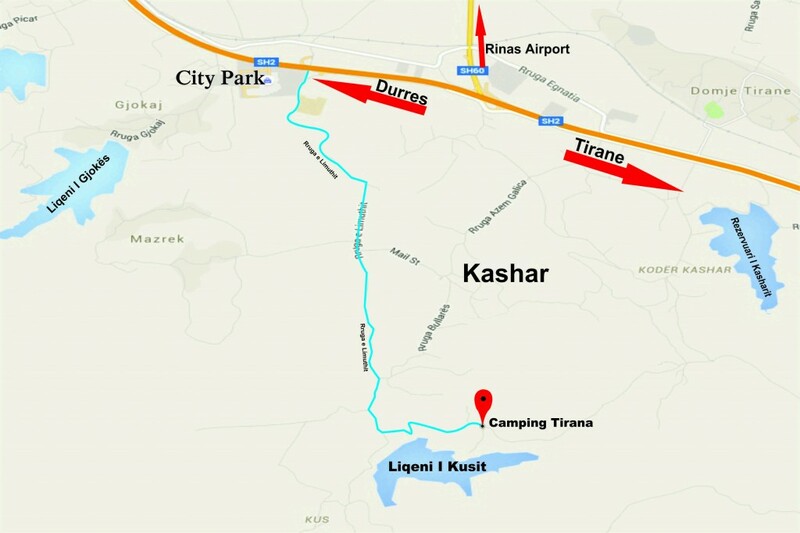 Where is Camping Tirana situated? Camping Tirana is located at about 15km west of Tirana. If you are coming from the north, via Shkoder, you follow direction to Rinas Airport and then take the highway Tirana Durazzo direction Durazzo. Take the first exit, Kashar, then follow direction for the big mall, City Park. From the City Park, we are located at about 5km: 4 km on paved road, and the last km on gravel road. If you are coming from Durazzo, after the small town of Vore, at about 4km, you find the big mall City Park. Exit here and follow direction for the Camping Tirana: still 4 km on paved road and 1km on gravel road. If you are coming from Tirana, exit in Kashar and follow direction to City Park. Then follow direction for Camping Tirana. For any problems, please stop at the big mall City Park N 41.368025. E 19.690468 and send a text message to us at this number +35 568 2242342 and we’ll come to get you in just 5 minutes.